Darnall Dementia Group provides a day centre based in a church in Darnall. Three days each week the main hall is turned into a comfortable, light and warm space where people with dementia, volunteers and paid workers can gather to enjoy each others company. 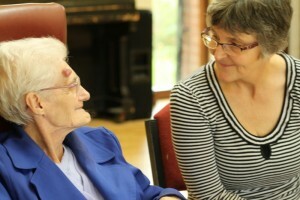 On Mondays, Wednesdays and Fridays we provide up to 10 places for people living with dementia. People are invited to attend one day each week with the possibility of another day being offered if that is appropriate. We aim for our attenders to receive one-to-one support so that the person attending can be involved in the decision-making and choose whether or not to join in activities. There are always options about the level of involvement and the input that attenders have. 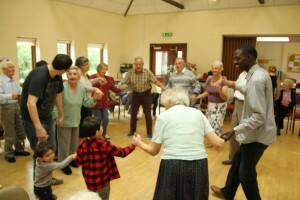 At the centre we create a relaxed, informal setting where people have a sense of identity and of belonging. By building a strong community people can develop significant friendships. Laughter and having a good time are high on our agenda of priorities; we want people to go home with an increased sense of well-being. There are numerous activities; talking and sharing life stories, artwork, looking at local history books, reminiscence, exercise group, short walks in the local community, puzzles and games, annual seaside trip, singing and dancing. We have regular concerts by Lost Chord, who bring flair and fun for a musical afternoon, and we were lucky to have Eric and Pam, to get us all singing, for many years. We often enjoy our own impromptu sing-songs. People who attend are invited to help with the practical tasks e.g. washing up, setting the table and on Wednesdays helping to prepare lunch. We undertook an Evaluation by Dementia Care Mapping(TM) in November 2014. The results of this will help us to form action plans to develop and improve the quality of care we provide.